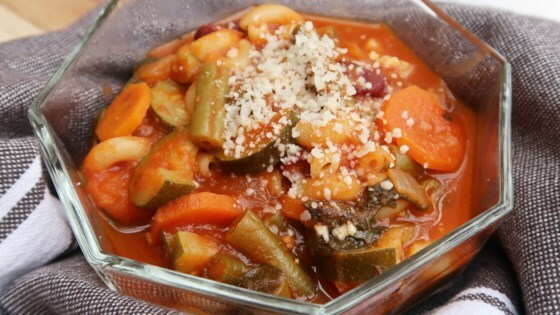 "I created this soup after becoming tired of the excess salt and lack of veggies in canned minestrone. I recalled a great bowl of minestrone that was overflowing with rich vegetables at the 'Sheepherder's Inn' in Sacramento, California. Great with a hearty bread, romaine salad and a nice Merlot!" Add chicken broth, water and tomato sauce, bring to boil, stirring frequently. If desired add red wine at this point. Reduce heat to low and add kidney beans, green beans, spinach leaves, zucchini, oregano, basil, salt and pepper. Simmer for 30 to 40 minutes, the longer the better. Fill a medium saucepan with water and bring to a boil. Add macaroni and cook until tender. Drain water and set aside. Once pasta is cooked and soup is heated through place 2 tablespoons cooked pasta into individual serving bowls. Ladle soup on top of pasta and sprinkle Parmesan cheese on top. Spray with olive oil and serve.